By this time next month (hopefully) we'll be holding Cody and adjusting to life as a family of 4. So I really wanted to do something special with just the 3 of us one last time before EVERYTHING changes and I hole up in my house and don't come out for months while I go nuts trying to figure out how to survive life with a newborn again. Ideally our last big outing would be closer to Cody's due date, but with Chris starting his next semester next week our time was limited with daddy. So Chris took of last Tuesday so he could spend the day playing with Sarah and me. We started the morning with our traditional Chris is off work breakfast treat--Cracker Barrel. I didn't take any pictures of that because no one wants to see me chowing down, but believe me, it was good! Then it was a quick stop at Wal-greens to pick up some Motrin (we think Sarah's two year old molars are starting to move) and off to Pump it Up for the pop in play time! 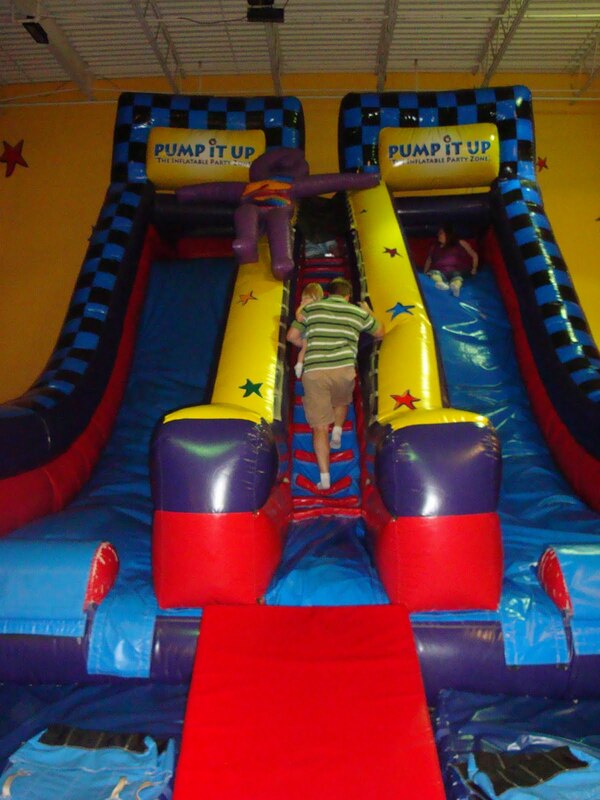 I've really been wanting to take Sarah but was apprehensive that it would be too crowded, or there would be to too many bigger kids to run over Sarah, or that she wouldn't be able to do anything and I'm not really in any condition to be climbing around on inflatables to get her if she got stuck. So we definitely needed daddy to come and help wrangle the kid. Of course the minute we get there I look at all the fun stuff and had to ask Chris to go buy me some socks because I didn't want to be left out of the fun! So yes, 8 months pregnant with Sarah I went roller skating. 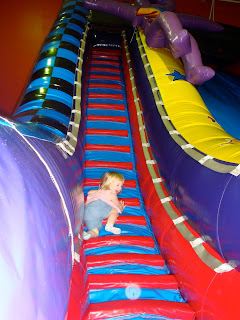 This time 8 months pregnant with Cody, I went giant inflatable sliding. Me and Sarah at the top of the giant slide that I had to carry her up in order for us to go down. She had a great time! And it wasn't over crowded at all. We stopped in the first play room where there was a slide, an obstacle course, some sort of jump wall thing, and an "arena" with basketball goals, joust poles, lots of balls, and oversized boxing gloves. Excited about going up the slide with daddy. Daddy's turn to carry Sarah up the slide. But the slide was too dark at the top in this room so both times (Chris and I each took her once) she was fine going up until you got into the dark top. Then she'd start crying. Then she'd giggle the entire way down. If you asked her if she wanted to go again she'd say "Yes!" but when you'd start climbing she'd cry "no! no! no!" So we turned our attention to the other inflatables in that room. And of course, she fell in love with the balls. A ball! A ball! A ball! Daddy helping Sarah slam dunk. We tried to entice her into doing the obstacle but it was really tough. So I had the idea to have Chris go through and hand Sarah over the back wall to him where all they'd have left is the slide to go down. But when we came up with that plan, we didn't know in order to get to the top of the slide you hand to go up a "rock wall" type back with very small foot and hand holds. So I'm waiting at the bottom of the slide to catch Sarah for quite some time when I finally make out Chris yelling "Natalie". I head to the back to see what's the matter and Chris explained the situation and handed her back out. To which she ran straight over to the ball arena for another 15 minutes. But I didn't want the ball arena to be the ONLY thing she did and we pretty much ruled out the big slide because whenever we asked she said "No!" so I thought we should try the obstacle course again. This time the plan was for both of us to go through it having one of us climb over the obstacle and then hand her up and over. And let me tell you it was tough! I had to shimmy under things that an adult, never mind a pregnant one, really doesn't fit under. But Sarah was loving it because over each big wall she got to slide down the other side after one of us handed her to the other sitting on top of the wall. She was giggling up a storm as we crawled through the last obstacle, a tunnel, and then I saw the rock wall. Oh my gosh! I could barely get myself up the top on those tiny foot holds and had to perch percariously up there while I waited for Chris to hand Sarah to me. Then we slid down together and she just squealed with delight! It was well worth it. After that while I was changing her diaper all she kept saying was "slide down. Mommy down. Daddy down. Slide." I'd ask her "are you having fun" and she's smile big and say "Shyesh!" Then we decided to check out the other play room. It had basically the same things except the arena was a little different and the room was better lit so we tried the slide again. She loved it! L-O-V-E-D it! We are talking as soon as we hit the bottom she was scrambling to get to the side to climb back up. The girl was wearing Chris and I out! We had to take turns on who would carry her up. Once you'd get to the top she's start pushing away from you because she wanted to go down by herself. Until she saw some other kids using mats to go down. Her eyes got real big; she wanted to try one of those! And sure enough one trip down there was an empty mat at the bottom and she grabbed it up like it was gold. Sorry the picture is blurry but she shot down the slide like a bullet. This is about the best one. And can you see she's getting a little bit of air under her mat. She's such a dare devil! With about 30 minutes left in the play time, Chris and I are both exhausted and our little energizer bunny just wants to keep going. So she starts trying to climb up to the top herself. There weren't that many kids left in the playroom anymore so I didn't feel bad about her potentially holding up the line and I was too tired to go chasing after her. So one of our awesome parent moments was born where I looked at Chris like "are you going to help her" and he said "eh" and I said "eh, if she can do let her". And I waited (nervously) at the bottom to see if she was going to fall backwards and come tumbling down the steps. But she made it to the top! I was amazed. Absolutely shocked! I really didn't think she could do it. And she crawled across the top and came sliding down. However, then she figured out it's fast not to crawl across the top and began just barely turning the corner at the top and coming down on her face, crammed up against the wall where one of us would pick her up and put her on the stair side so she could start the process all over. She was loving it! She was so happy and giggling the whole time. Afterwards we had all these plans for how productive we'd be while she took a nap. But I looked at her as we were walking out to the car and told Chris "she's not going to make it" so we went to Grandma and Grandpa Schwartz's house to feed her lunch and put her down for a nap. After the nap we thought we'd take her out for a special treat so we went to a cupcake bar in Bartlett. And wouldn't you know it, my child wanted NOTHING to do with her cupcake. Wouldn't eat one bite. Didn't want the icing. She just wanted the marshmallows off the top. So we wound up buying her 3 "shots" of marshmallows so she wouldn't fuss while Chris and I enjoyed our giant cupcakes. I just kept thanking Chris the rest of the evening for taking off work to play with us. We had such a great day and I'm glad we had the opportunity to take a moment to make one last special memory of just the 3 of us. I'm getting a little nostalgic and weepy eyed (dumb pregnancy hormones) whenever I think that it'll never just be us and our little girl again. But that's for another time and another post. 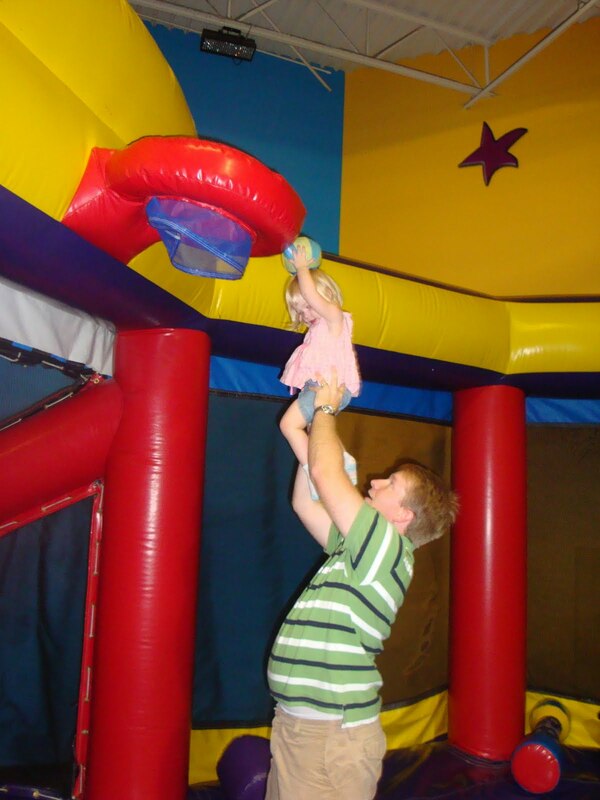 I'm also planning one more adventure to Pump it Up with Sarah before Cody comes since I now know she can climb the slide by herself. And so help me, if this baby doesn't come on time you may find me up there 40 weeks pregnant trying to bounce this boy out! Here's a horrible little video I took of Sarah climbing up the slide by herself. It wasn't even worth editing to try to make it better so please forgive the bad camera work. I was just so impressed that she was able to do this. I think it's cute that at first she's climbing up using the handles because that's how mommy and daddy were doing it. Then you can hear her giggling as she's coming down and when she gets to the bottom I ask something about "was it fun" and she says "I'm fun" then I ask "what'd you do" and she says "slide!"